Mary from the Prairie: What Gives? When people think of the term "materialism" it is though of in terms of someone wanting something for himself, someone who is not content unless he receives "things." But it appears there is quite a bit of materialism on the giving end as well. In fact, according to AdventConspiracy.org Americans spend $450,000,000,000 (that's $450 Billion) on Christmas! I don't know how the bean-counters came up with that dollar amount, but that's a lot of ChiaPets and electric razors! There's a lot of talk around the office fax machine and water cooler about what people are giving kids and loved ones for Christmas. What's sad is when the discussion includes the lament, "I don't know what I'm getting for my (insert close family member) for Christmas this year." Or the growing cop-out, "I just give gift cards. Everyone can use a gift card." Hold on a minute! If you're a close relative you should know something about their tastes, their likes and dislikes, their passions and pet-peeves, right? It would make sense that you might be able to think of something meaningful without much prompting, especially from someone who doesn't even know the recipient. Having to even ask a question like that indicates that there's more you need to know about these people in your life. Here's an idea - Rather than think of the perfect "thing" to get for someone, consider what you can give that will show that you are interested in knowing your loved ones more deeply over the coming year. For example, if you know someone who keeps a journal, give a comfortable pen (or refills for his - or her - favorite pen) and a blank journal (in his - or her - preferred style - leather? hardcover? spiral-bound? ), with the first entry from YOU, saying how much he or she means to you and how you hope he - or she - grows from the journaling experience. If you want to give more, a gift card to Starbuck's - or It's A Grind - would be a nice touch. 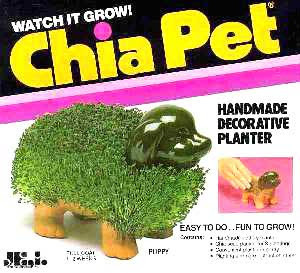 Or, here's an other one - Let's say you already succumbed to buying a ChiaPet for your daughter. Add a note to it with a written commitment to go to the local SoupPlantation (salad bar) for lunch once a month - just the two of you - with the purpose of getting to know each other better. There are as many ways to get to know each other as there are cheesy, useless gifts out there. What gifts will you give this Christmas to get to know your loved ones better? $450B? Thought we were in a recession... I think we need to spend that amount on feeding the kids who don't have food or giving blankets to those who are cold - $450B - that's a lot of mula!! !